Let’s Get Lost is a YA contemporary novel that follows Leila on a road trip to see the Northern Lights... or so it would seem at a glance. But this book isn't just about Leila's journey as each section introduces a new person she meets along the way and explores the impact they have on eachother's lives. In the first section Leila meets Hudson who is working at a garage she stops at to have her car checked, he is due to have an important interview about a scholarship the next day until Leila intervenes. Next up is Bree a hitchhiker who Leila picks up by the side of the road - but can she help Bree fix her broken relationship with the sister she ran away from? In section three we meet Elliot who dreamt his prom would turn out like an 80's movie but instead everything is going wrong, and in section four we’re introduced to Sonia who is struggling to deal with the sudden death of her boyfriend and how to tell his family, who treat her like their own, that she has found someone new. Last up we rejoin Leila’s personal journey and the details of her real story are finally revealed. As a protagonist I instantly warmed to Leila as right from the start I admired her decision to take the road trip alone just because it was something that she felt she needed to do. I also really loved meeting all of the other characters and learning their various stories along the way. The switch between their five very different lives as well as the locations along the road trip was something I really enjoyed and the format meant the story really pulled together in the end. When the final section rolls around you'll be desperate to find out Leila's story and the unexpected reason behind her road trip. After following her for four sections and seeing how she positively influences each of the other's lives just means that her own story has all the more impact when finally revealed. Although advertised as a road trip novel (even by me during this review!) it’s less of a complete road trip, more just the important trip snippets where Leila encounters other ‘lost people’. If you’re looking for a real day-by-day road trip novel you won’t find it here, but I would urge you to give this unique debut a chance – you might end up enjoying it as much as I did! 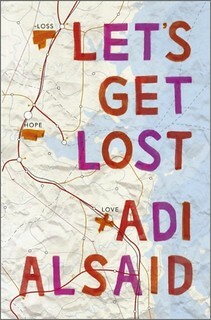 i'm glad you enjoyed let's get lost, i'm currently reading it and loving it so far! This sounds great! Must pick it up sometime. Thanks, Erin!